Amazon Kindle Keyboard 3rd Generation | Model D00901 | Wi-Fi only has carrying case! (Kindle Keyboard with WiFi & 3G. This is a previously-owned Kindle Keyboard (K3) featuring both Wifi and 3G. noticeable and will not affect performance or reading experience.). Condition is Used but Like New. No Scratches. (Kindle Keyboard (K3) with WiFi (Model D00901). This is a previously-owned Kindle Keyboard, which I have refurbished. affect the operation of the Kindle or the reading experience.). INCLUDED: a standard micro-B USB charging cable and, for US. Amazon Kindle D00901. Condition is Used. Shipped with USPS. No charging cable. What you see in the pics is what you get. Case included! Amazon Kindle Keyboard 3, 3G Wi-Fi, 6", 4GB, D00901. Screen in excellent condition- no dead pixels. Amazon Kindle Keyboard (3rd Generation) D00901, White, WIFI 3G. Screen has a large dead pixel. Amazon Kindle Keyboard eReader. ~Reset to Factory Default - Unlocked - Ready to Go~. ~Graphite w/Black or White Background for Easy Reading~. ~Wi-Fi and 3G Compatibility~. ~Original Box w/Quick Start Guide~. Up for your consideration is this well-kept, gently-used Amazon Kindle 3rd generation eReader with black Speck cover, power cord, and instruction booklet. Works great!! No issues. Please see photos for more details. I’m happy to answer any questions you may have about this auction item before placing your bid. All sales final. Payment is due via PayPal within 72 hours of close of winning bid. Thanks for l@@king!! This is a Amazon Kindle Keyboard 3rd Generation, Wifi, 6", D00901, 4GB, E-reader, Gray. Device has been tested and is in working condition. Product is pre-owned, normal signs of use should be expected. USED/WORKS 100%. 100% GENUINE AND WORKING. THIS TABLET HAS BEEN TESTED AND IS FULLY FUNCTIONAL. SEE PHOTOS FOR FURTHER DETAILS. No local pickup option is available. NO OTHER ACCESSORIES ARE INCLUDED. AMAZON KINDLE Model No. DAREDEVIL, The Man Without Fear, 1972 90 AUG, with The BLACK WIDOW. with RED LEATHER COVER. QGreat Deal. Prompt dispatch. DAREDEVIL, The Man Without Fear, Lot of 4 COMIC books. This is a used item. It has been tested and cleared so it works properly. Amazon Kindle Keyboard (3rd Generation) D00901, Graphite, WIFI. Screen in fair condition- a dead pixel or two. 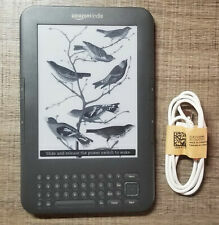 Amazon Kindle Graphite 3G Wi-Fi 6" 4GB. Good Condition. ENJOYED-WHITE AMAZON KINDLE-MODEL NO. CHARGING CORD IS INCLUDED WITH THIS KINDLE. The price will be cheap due to these problems but it does work well. There are cracks in the plastic at the bottom corners of the screen. Amazon Kindle 3rd Gen Keyboard 4GB Model D00901 Wi-Fi 6" Dark Gray Tablet as is for fix or parts . This is a nice used Amazon Kindle Keyboard (3rd Gen) D00901 eReader. It is WiFi enabled in Graphite color. It powers up and works just fine. The kindle belonged to my mom and was used but not abused. Lot of 33. This item is untested, any issues are unknown. The item may have some signs of cosmetic wear. Some Phones/Tablets/Ipods may have cracks and/or missing parts (sim trays, batteries, backs, Etc.). See pictures for reference. Charger not included. Item in good condition see pictures. Comes with charger. Amazon Kindle Keyboard (3rd Generation) D00901 (WiFi+3G), 6in, eReader. Kindle reader that supports WiFi and 3G services. 4GB - very good condition - rarely used. Amazon Kindle Keyboard Wi-Fi E Ink display Graphite D00901, . Condition is For parts or not working. Shipped with USPS Parcel Select Ground. Small crack on back of reader, at bottom, which doesn't affect the operation of the kindle. Works great. One owner, hardly ever used. Amazon Kindle D00901. Condition is Used. Shipped with USPS. No charging cable. 4GB internal. 2 Amazon kindles. We are not available on weekends. Kindles are stuck on the Empty Battery Screen, soft and hard reset attempts have not worked. We rely almost entirely on the donations we receive from our supporters toprovide specialist palliative care to adults, children and young people from the North East of England. There is no issue with displaying text. A 3G GENERATION 3 AMAZON KINDLE! Elvis may be the king of rock and roll ,but your. Excellent communication. Very happy!A . Item as described. Many thanx! Amazon Kindle Keyboard (3rd Generation) D00901, eReader, WIFI 3G. M-Edge Case Included. Screen in excellent condition. Working Kindle in excellent condition. Includes dark blue/purple Belkin zipper case. Include charging cord. Amazon Kindle Keyboard. Some slight scuffs and wear on both screen and case, but works perfectly. Has been reset for easy set-up. Including a micro-USB charge cord. It’s a Verizon cord but works nonetheless. Amazon Kindle Keyboard (3rd Generation) D00901, Graphite, WIFI 3G. Screen in excellent condition- no dead pixels. Title: Kindle Keyboard Wi-Fi 6" E Ink Display Tablet White D00901. Model: D00901. MPN: D00901. 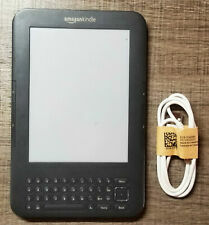 Details about the item: Very Good Condition Kindle Keyboard Wi-Fi 6" E Ink Display Tablet. Includes USB Cable, Power Adapter, and Book Reader / Tablet. Amazon Kindle Keyboard (3rd Generation) D00901, eReader, WIFI. See 3rd photo for example. Amazon Kindle Keyboard (3rd Generation) D00901, WiFi, 6in, eReader.